LD (Low-Def) barney_vest and barney_helmet for Blue Shift. Does anyone have an LD style model of of Barney's vest and helmet models from Half-Life Blue Shift? 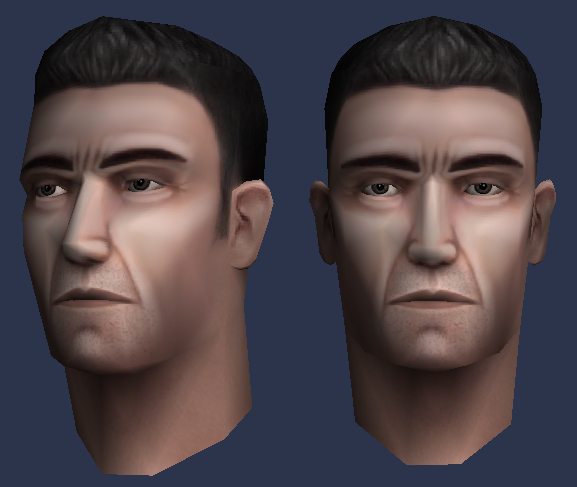 I find it a little off-putting when I'm playing with HD models turned off that these two models are still HD-style. Re: LD (Low-Def) barney_vest and barney_helmet for Blue Shift. You mean the models from the old Guard Duty Video Trailer, right? Can someone help me to find this Barney model? The only one I can find that is similar to that barney model is this one by LeonelC. I looked everywhere for the other model but it doesn't seem like it's around anymore. I made a LD-styled SD Barney some while ago, i'm gonna post it here in case someone would find it useful. Edit: I posted a picture and i want to say that the .rar file includes vest, helmet, deadbarney, wrangler, bshift version and SC version. Made one for Sven, so that'll be a thing in the future at least. Original Gearbox's vest and helmet models were in HD quality initially. Sorry. But if someone is looking for LD-style Barney check the Cleaner's Adventures Barney (Submodel 3). Yeah. It has creepy vest for todays 2k18 But you can edit it or take just a head. Wow -Rusty-! Like yours one! Wow, a post from Liquidator! Yeah, I also like -Rusty-'s face texture.